Giorgio Vasari’s The Lives of the Artists (1550, 1568) has been a key subject of study for students of the Italian Renaissance over the hundreds of years since its publication. It has maintained a powerful grip on the historical imagination and continues to influence the way scholars treat the Renaissance, its artists, and the entire intellectual enterprise of Western art. 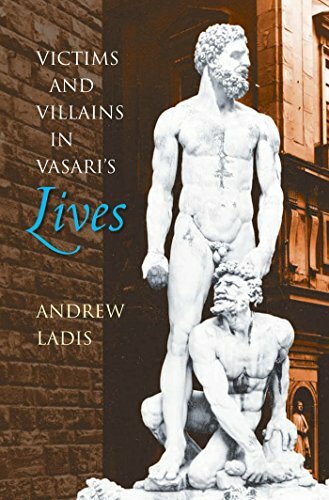 Focusing on Vasari’s literary and narrative achievements, Andrew Ladis turns to Vasari’s villains, rather than his heroes, to demonstrate the biographer’s foremost interest in glorifying Michelangelo. Approaching Lives on Vasari’s terms–as the grand story of the rebirth and triumph of art in Italy–Ladis argues that Vasari was not a mere compiler of facts, but a shrewd, self-confident author aware of the power of metaphor. With a literary reading of the text, Ladis analyzes Vasari’s motives and methods as an attempt to portray the great Michelangelo as a Christlike exemplum of ultimate light and goodness. Through biographic details both real and invented, Vasari presents all other artists as various players with varying degrees of heroic and villainous value. Antiheroic characters such as Buffalmacco, Lippi, and Castagno, Ladis argues, serve to accentuate the contrasting greatness of Michelangelo.